Thought about giving the IP's a Trial? The weekend of 11/12 of May is your big chance when the Waikato-Bays region selects teams for the annual Inter-Provincials. 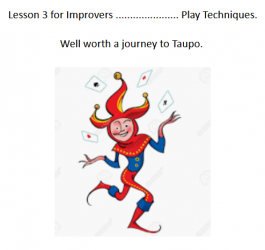 Our trials are to be held at the Tauranga club - read our blurb by clicking here. The 2019 Inter-Provincials will be held in Christchurch on the 23rd to 25th November. You can read all about this long-standing event by clicking here. 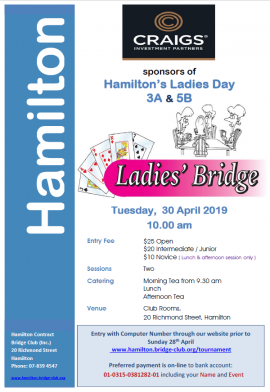 Bernadette and HesterA last minute entry into the Waikato Bays Junior Bridge Championship League by four players from Waitomo Bridge Club had excellent results for their club. 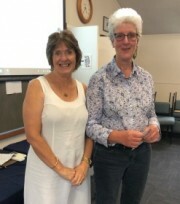 The first tournament was hosted by Cambridge Bridge Club and, competing against players from across Waikato, Bernadette Barry Addy and her partner Hester Bolitho won the first event. Cambridge husband and wife team, Chris and Hennie Van Empel were close behind and Bob and Ros Strawbridge, also from Waitomo came in third. 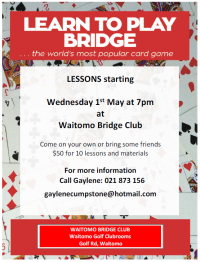 The next event in the series will be hosted by Matamata Beridge Club on May 4th. We're not fooling! Entries for the knockout competition to find the region's winning pair to contest the inter-regional final at Congress close on the 1st of April. Check out this article that appeared in the NZ Herald on the 11th of March. Listeners of The Bridge Zone Show will know of Professor Samantha Punch's innovative work in exploring the sociology of bridge. Working at Stirling University in Scotland Professor Punch oversees a PhD research project in an emerging academic field exploring interactions within the mind sport, well-being, healthy ageing and social connection as experienced in the bridge world. NZB chairman Allan Morris writes a newsy report of big tournament successes and what your Board has been up to including notice of impending rotational retirements. Click here to download it. 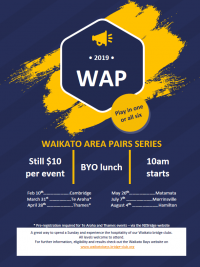 WAPs in 2019Coming up this Sunday 9th February. Always a good day at Cambridge. You know the drill - pitch up with your lunch, enjoy the morning tea, sit down and slap $10 on the table. Come along and join them for a fun session. Come as a group, work and learn together, it really helps to have someone you can discuss things with! Every day the same hands are played simultaneously at several clubs. At 5pm and 11pm they get scored "across the field" - often over 100 pairs and sometimes over 300 pairs take part from 37 different clubs. The results have always been of interest to many but they're about to get even more interesting to many, many more. Check out this article to see what it's all about. By popular request, we are targeting this years seminar at qualified or very experienced directors in the Waikato-Bays Region, with a view to increasing our pool of tournament directors. There will also be email training on tournament planning during the weeks before. Morning Tea from 9:30. 10:00 start. Morning and Afternoon session, lunch is provided. Please enter on the NZB website by 23 February if you wish to take part in the Pre-Seminar Correspondence Course.